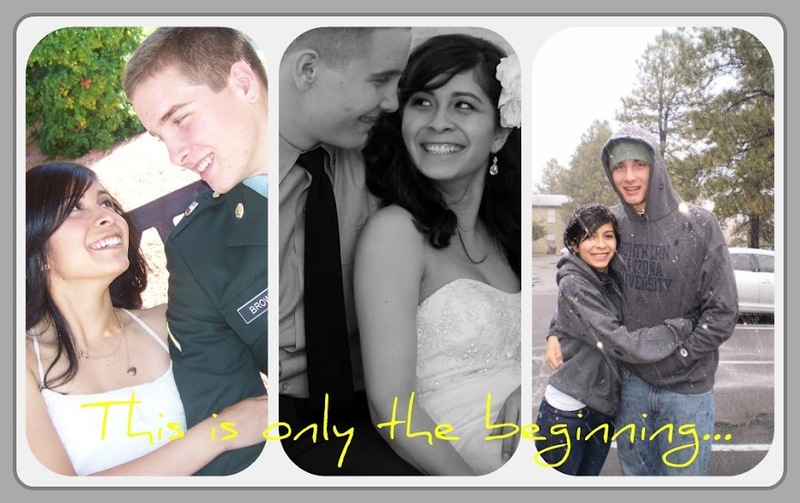 Newlywed, Army wife, student; and it's only the beginning! So today I am doing my first ever Blog-Hop over at Brittany's Aviation of Love blog! This is exciting! Well to everyone who comes and visits my blog today, my name is Ashley I am a newlywed married to my hero his name is Ty and as you might guess we are a young couple actually 19 and 20 to be exact! Age did not stop us from following our hearts! I am currently working and studying at NAU while he is in the Army Reserves and working a civilian job. I love to craft, cook and just being me! Well that's a small intro to my life right now! I hope you can follow us on our journey! 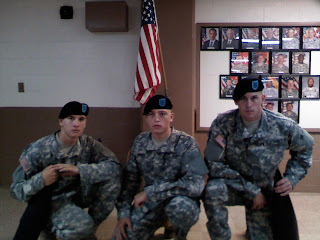 I just wanted to take a moment of my day to thank all of the veterans who have served and are serving in our military. I will always be greateful for all the service they have done and continue to do. Many of my family and friends, including my husband have served and are serving in the military and I will always be forever grateful! Thank you all for your service! May God bless you all and continue to give you the strength and courage to serve this country and fight for our freedoms! I would also like to thank the families and wives standing behind all of our courageous men and women! 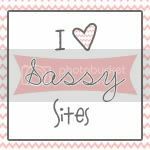 I found this survey over at Erin's Moore To Love blog, I thought it was cute and a good way to introduce myself! A. Age: Is it weird that I am only 19, but I feel a lot older for my age! I'm not sure that I like feeling older! C. Chore that you hate: I hate washing dishes & cleaning the bathroom! D. Dogs: We had an adorable Shepard mix named Marley :( She was the best dog ever. E. Essential start to your day: The first thing I have to do when I wake up is brush my teeth! I. Instruments you play: I used to be able to play the flute (kinda), but I am horrible now! K. Kids: None yet! In a couple years! M. Movie: I am currently obsessed with the Twilight movies! As if that's a shocker a lot of people are! P. Pet peeve: I have a lot that I never even realized! Q. Quote from a movie: So it's not gonna be easy. It's gonna be really hard. We're gonna have to work at this every day, but I want to do that because I want you. I want all of you, for ever, you and me, every day. Will you do something for me, please? Just picture your life for me? 30 years from now, 40 years from now? What's it look like? If it's with him, go. Go! I lost you once, I think I can do it again. If I thought that's what you really wanted. But don't you take the easy way out. The Notebook awesome movie!!! V. Vegetable you hate: Asparagus & celery! Yuck! W. What makes you run late: I am super indecisive so it can take me about hour to find something to wear! I'm getting better at it though. X. X-rays you've had: Since being in a car accident I believe they took x-rays of my chest, head, pelvis, and hand! Y. Yummy food that you make: I think I can cook really well! So everything! Jk I would have to ask my husband! Z. Zoo animal: Lions are my favorite! Well I am done boring all of you with my lame weekend! I hope everyone had fun! Well today was the first time I worked out since my first year of college! Ugh I know I hate beind lazy! But hopefully I start getting in gear and getting back into shape! Speaking of working out I love really high tempo songs when I work out it keeps my blood pumping and keeps me motivated. One band I love listening to while i'm working out is Paramore. They are pretty amazing, I'm a big country fan but when I need to listen to a bit of rock Paramore is one of the few I turn to. Here is one of their new songs, it's called Monster. Our Halloween was pretty lazy. We carved our pupmkin with his brother and sister which was pretty fun! But other than both of us had work all weekend and errands to run. I hope we can take our christmas pictures soon! I am way excited to send our christmas cards out hopefully soon! 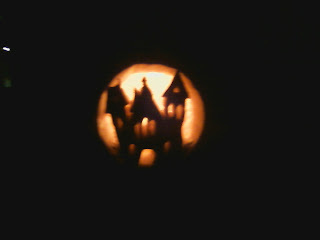 Anyways here is our pumpkin!